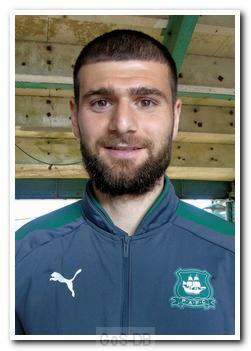 Although born in Karakocan in Turkey, Ciftci played youth football in the Netherlands for Haaglandia and ADO Den Haag, and then joined Portsmouth as a 15-year-old for a fee of £80,000. He signed professional terms in July 2009 but it was August 2010 before he made his first team debut as a substitute in the Championship against Coventry. After 22 appearances and 2 goals in the 2010-11 season, Ciftci turned down a new contract at Portsmouth and instead signed with Kayserispor in the Turkish Super League. He scored three goals from 11 appearances at Kayserispor during the 2011-12 season before his contract was mutually terminated in June 2012. Following trials in Holland at NAC Breda and ADO Den Haag, Ciftci joined NAC Breda in the Dutch Eredivisie on a three-year contract in August 2012. He made just seven appearances with no goals and left after just one season. Ciftci had a trial at Scottish Premiership club Dundee United before joining them on a two-year contract in July 2013. During the trial period, Ciftci shared a room with another future Pilgrim, Graham Carey, when they travelled to Germany and Spain. His first goal for the Dundee club was a stunning strike in a 1-0 win against Wigan Athletic in a pre-season friendly. In his first season with the Tangerines, he scored 17 goals from 40 appearances in all competitions. His first league goal for United came in September 2013 against Ross County, who were managed by Derek Adams. In that match he was substituted on 72 minutes by another player to eventually play for Plymouth Argyle, David Goodwillie. Ciftci’s first goal in his second season at United was again against Ross County in August 2014. This contributed to the poor start that Ross County had that season and to Derek Adams parting company with the club just five days later. During the 2014-15 season, he appeared 42 times and scored 16 goals. In July 2015, Celtic signed Ciftci from Dundee United for £1.5 million on a four-year contract. The move to Parkhead saw him feature in Champions' League, Europa Cup and Scottish Premiership games at the beginning of the 2015-16 but by January 2016, after 4 goals in 22 matches, mostly as a substitute, Celtic chose to loan him out for the remainder of the season to Turkish club Eskisehirspor, who played in the Turkish Super League at that time. He managed four goals (two from penalties) in 12 appearances. Returning to Celtic, Ciftci made four further appearances, all as a substitute, with no goals before being loaned out again, this time to Pogon Szczecin of the Polish Ekstraklasa (top tier), where he played eight times with no goals before suffering an ankle injury in April 2017. In the third week of the 2017-18 campaign, after struggling to make his mark with the Glasgow club, Ciftci agreed to swap one green shirt for another in a season-long loan deal at Home Park. However, his spell with Argyle was a considerable disappointment. 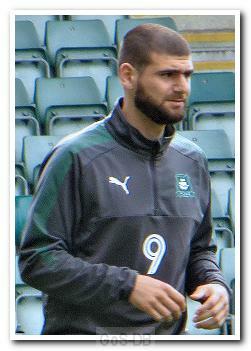 Despite some glimpses of good hold-up play, he appeared ill at ease when playing as a lone frontman and failed to score in his time at the club (his only 'goal' was a successful penalty in the shoot-out to decide the Checkatrade Trophy match with Exeter City at Home Park in October 2017). In January 2017 his loan spell was cancelled to enable him to return to Celtic and then sign for Scottish Premiership side Motherwell on loan for the remainder of the season, under the tutelage of former Pilgrim Keith Lasley and linking up with ex-Pilgrims Peter Hartley, Carl McHugh and Craig Tanner.